LaCité gives you Montreal's Best Value Apartment Community! This is the perfect opportunity for students or young professionals to live in Montreal's hottest neighborhood at a great rate. We are steps away from McGill University; with an abundance of parks, European style bakeries, cafés and incredible restaurants and nightlife all within walking distance, it won't take you long to see why LaCité is the perfect place to live, work and play. 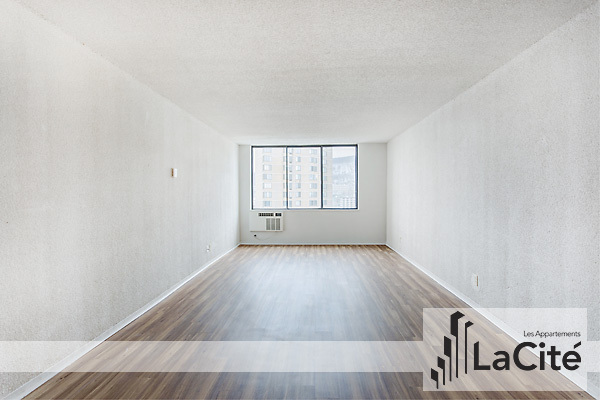 We have a great Bachelor/Studio (2 ½) apartment available for rent in downtown Montreal. Our spacious bachelor apartments are the perfect solution for those looking for a quiet escape from everyday life. LaCité's Residents enjoy preferred pricing as well as direct access to Club LaCité. The facility hosts a fully equipped gym which includes strength and cardio equipment, a tennis court and an outdoor heated pool open year round. In addition, the building is attached to an underground shopping center, Les Galeries du Parc, where you will find grocery stores, a pharmacy, a liquor store, a post office, restaurants, a cinema and many additional retail stores. LaCité residents enjoy preferred pricing with Club LaCité fitness centre, Montreal's only facility with an outdoor heated swimming pool that is open year-round. Residents enjoy underground access to a wide selection of shopping at Les Galleries du Parc. No need to step outside when running errands! Residents find themselves relaxing and socializing in our newly designed community oriented lobbies complete with complimentary Wi-Fi access. Contact one of our professional rental consultants today for more details.